OB Convert: When is it a good time to give money to the homeless? The other day I noticed someone throwing something at a homeless guy standing at one of our intersections near the freeway. The homeless guy had a sign (I didn’t see it to read it) And no, it wasn’t cash thrown – it was trash. I’m confused. I thought OBcians were tolerant and caring people. So, my question: just when is it safe to give money to the homeless at these intersections? We in OB have had a lot of discussion about the homeless (haven’t you noticed?) lately. And we’ve all seen these folks standing near the freeway. Usually it’s men, but occasionally it’s a woman. Many are vets – up to a quarter of all homeless are vets, so if an old grizzled guy holding up a hand-written sign says he’s a vet, probably is. But hey, even the vets are dissed in Point Loma, and many of the passersby are from other parts of the Peninsula than Ocean Beach. So, I could just slough it all off, and say the person throwing the trash wasn’t from OB – but I’d be lying. Over the course of much of last year, the OB Rag and the community at large, as I was saying, has been involved in a “discussion” about the homeless. And this so-called discussion has opened up fissures in the OB glacier of coolness and hipness and has exposed – much to our chagrin – an ugly, icy canyon of resentment towards the homeless (but just the “bad” homeless – we still love our “good” homeless). As you ponder your response to the next homeless person, remember that we are still in the greatest economic downturn since the Great Depression. Some would say to themselves, ‘there but for the grace of god, go I.” Some others wonder why is that young guy asking for a handout. He’s young enough to go out and work for a living, isn’t he? But hey, there are no jobs out there! Even for young, able-bodied men. Some of those who wish to climb out of this steep crevice, counter by actually feeding the homeless through church-sponsored or condoned food-lines. Others say, don’t give them cash, go out and actually buy them some food, so they won’t spend your hard, earned money on booze, cigarettes, or worst – toiletry items. Many OBcians do hand money to these guys – or else why would they keep coming back and suffering through the harassment of a few? But, whatever you do, don’t ignore them. Look them in the eye, smile even – they are human – despite rumors to the contrary spun by a certain OB surf shop. And if you have some extra change, hand it over as a good-will gesture. What I do, is to acknowledge their presence. And if they ask for something, I simply tell them I’m unemployed – which is true. But I save spare change in the little holders in my console, and once in awhile, I will hand it out. But if you do that, be careful, your human side might be showing. To the “Confused OBcian”, the simple fact is that OB in some ways is like anywhere else. Yes OB is largely a progressive and tolerant community, but that doesn’t mean everyone who lives in OB thinks that way. Even as far as tolerance, everyone’s degree of tolerance isn’t the same. 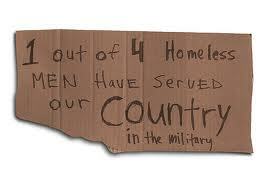 Like OB Convert said, a quarter of the homeless are vets. The sad thing is, there is such a huge draw down going on in the military that uniformed people are getting kicked out left and right like flies, or rather are not being allowed to re-enlist and are unexpectedly finding themselves without a job. 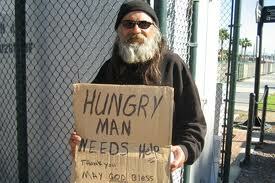 The sad fact is, there are over 9000 homeless in San Diego County and – due to budget cuts – services are dwindling. It’s always a judgement call, but I say give when you can. And don’t give a thought as to how “your” money is being spent – the guy on the street doesn’t ask me how I spend MY paycheck. It’s also cool to carry in your car, those dry dog food pkgs, and give one or two to the homeless with furkids. Even the most caring of obecians can simply get worn down. I give what I can, when I can, but I admit every time I find someone using my drive way as a bathroom, or going through my trash and leaving a mess it wears me down a little. I think that any time is a good time to help a person in need financially. When and how much is up to our own individual feelings of compassion. However, Pema said that people with less money do give money to people in need. I think the reason that those of us who have limited funds help others financially is that we are “closer” to the situation. We know that there are somethings that only money can buy. Recently, the OB Rag published my article, “Homelessness Myth #20: They Make Millions” to debunk the false belief that homeless people make big money from begging/panhandling. Perhaps my article would be helpful to some people in our conversation about homeless people and money. I think it’s great that there is so much positive sentiment on this site regarding issues facing the homeless, but the reality is that most homeless people are not simply people that need a job. There are some sober, able bodied people who are willing to work that end up homeless, but I’ve worked my entire life with the homeless and I can tell you that is unusual. The vast majority of the homeless have serious mental health problems and/or addiction issues that must be resolved before they will be employable. A lot of well-intentioned “helping” is also “enabling.” I’m glad you want to help, but if you really want to help the homeless, I urge you to donate your money, or even better your time, to one of the numerous organizations that provide services to the homeless. You raise great points and offer super resources, pzl35! Although not a charity by any means, there are fabulous ways to contribute your resources and time so as not to enable, but to raise awareness. I also encourage everyone to reach out to one of these organizations, and have provided a few more below. It is true that much of homelessness is in part due to mental health challenges or substance abuse concerns- or even the economy as we see it today with the lack of jobs, lay-offs, eviction notices, and so on. And yes, it can be extremely frustrating when it impacts our own backyard (or alley, for that matter) . I live in OB, and love its’ character, too! I also work with these populations as a nationally certified rehabilitation counselor and am a counselor to students with disabilities at a local community college. Many of these folks are able to utilize the services offered by these various organizations, and are able to go back to college and pursue their dreams. I have seen it so many times- yes it is seldom, but we must celebrate the small successes, even if we don’t see it all too often. I have pretty much dedicated my life work to supporting- not enabling- those with various abilities and unique challenges gain independence and employment so they can be active members of their lives. As a part of human nature, it is crucial to be able to give back, not just monetarily or with human or pet food, but to appreciate how our strengths and time can help guide others. Being that I’m not rich and don’t know a lot of people who are I can’t really speculate on their way of thinking. Now this is just a personal speculation, but I think as far as middle income people who seem to express a disdain for the homeless, I think just maybe that deep down they do in fact have at least some compassion, but they have a deep down fear that this is something that could happen to them someday. They convince them selves that it’s completely the fault of the homeless person and that as long as they make all the right decisions in life this will never happen to them. I don’t think encouraging off ramp begging is a good idea for safety reasons. I often worry about these people getting hit.